One of the enemies of businesses is being unsure which forms of online visibility is bringing in the enquiries, making it hard to determine whether there’s return on investment. There was a time years ago when these directories achieved good Google rankings for search phrases. So if someone searched for ‘red widgets’ they’d find the directory prominently in Google, would click through to advertiser pages and, in theory, make contact. But many of the directories fell foul of Google and have never recovered that prominent search engine ranking. This means that the only people who would find your paid listings on those directories would be those that found those directories somehow. We’re not saying that online directories are awful but we are saying that we’ve seen far too much over the years that leads us to be suspicious and to encourage businesses to do their own analysis. If you pay for profiles within online directories then you’ll be familiar with that annual call asking you to renew and you asking the question “is it worth it?”. This guide takes you through step by step so that you can make the right decision when considering renewing your online directory listing. Nothing matters more than you knowing for sure where enquiries originated from. If someone rings up your business, or emails, or fills in an enquiry form, it’s your responsibility to try and link that back to the source, which may include online directories. If you haven’t already seen it, we’d encourage you to read our How to link your incoming enquiries back to their marketing source guide. 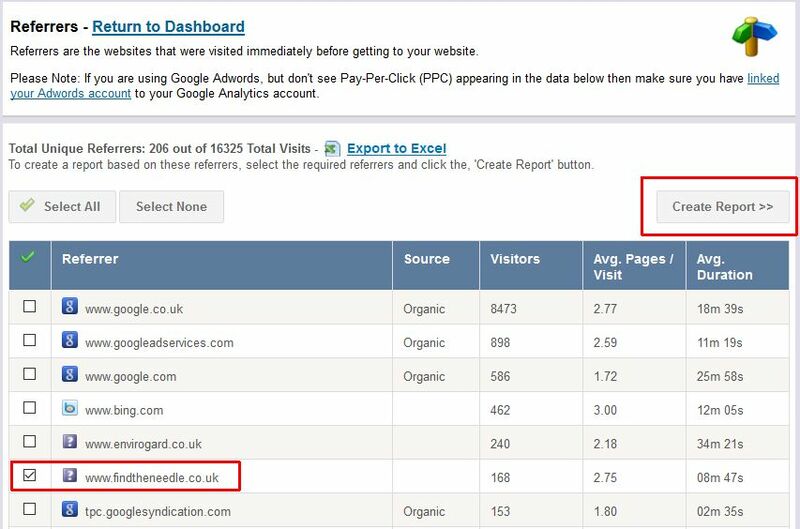 Focusing purely on what A1WebStats can show you about online directories, you can use the Referrers report to gain some insights. First select a long date range from the date picker (a year would be a good range). Then click on ‘Referrers’ from the main navigation bar. Look through the list of referrers to identify the directory names. 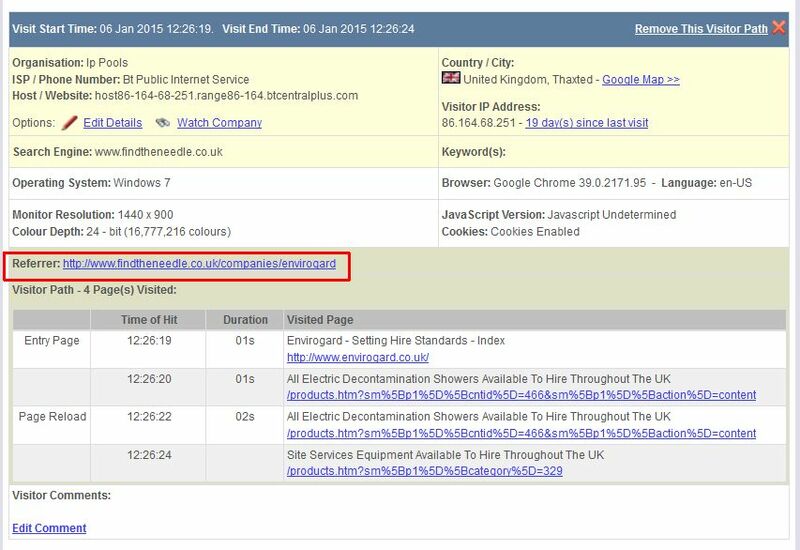 For example, you can see findtheneedle.co.uk in the example below, which has been ticked ready to click on ‘Create Report’. The report you see will show the number of clicks from that directory into your website over that time period. You should be able to see the page they clicked from (on the directory site) and how they then navigated through your website after landing, as you can see in the example below. Looking at the data in that way may create an impression that the level of clicks from that directory was good or bad, which is your starting point, but isn’t the complete story. What if potential customers saw your profile/advertising on the online directory and rang you or emailed you, and may not have even clicked through to your website? How would you know? What’s unfortunately missing in so many businesses, when an enquiry comes in, is to ask the important question of “How did you find out about us?”. If the answer is “online” or “Google” then there should be supplementary questions such as “was that a search result, a directory or something else?”. Anything in order to get more information from them so that you can build a clearer picture of what contributed towards the enquiry, including where an online directory may have made a contribution. The online directories learnt a long time ago that many business websites are weak, which is why they encourage you to build your profile on their directories (as profiles on those directories are often more likely to generate an enquiry than the client website itself). It also allows them to throw figures at you such as “1,000 people saw your profile pages last year and many of those would have made contact with you”. If you don’t have enquiries tracking/logging systems in place then you have nothing to respond to the online directory with, other than “well, we didn’t get that many enquiries from those profile views”. When you have a rigid system in place that links incoming enquiries back to their marketing sources, you are then in a position to effectively measure ROI from online directories.